Middle of the night in the Nevada desert, a little ways off the Tonapah Highway. Melvin Dummar has left the main road to take a whiz. Decent young fella: even at this remove from civilization, he steps around to the blind side of his truck and looks both ways before undoing his fly. A moment later he’s back in the cab of his pickup, wheeling around to return to the highway, when his headlights sweep something. Sprawled in the dust is an old coot in a flying-jacket, with silver hair like a fright wig grown tired: a streak of dried blood below his left ear seems the natural complement of all the other stains upon his costume and person. He says he’s Howard Hughes. Melvin and Howard is the title of this movie, and a fit and proper title it is. But the film is scarcely more “about” the putative relationship of the legendary billionaire and the gas-station operator who almost got a share of his estate than, say, All the President’s Men was about Richard Nixon and his helpmates. Less than a reel is taken up with Hughes and Dummar’s nocturnal passage to Las Vegas (where the old man asks to be dropped at the service entrance to the Sands Hotel, and bums his Good Samaritan’s last quarter); and only the last reel or so is devoted to Melvin’s receipt of “the Mormon will,” seven or eight years later, and the celebrity it brings. The Killer Elite / Noon Wine (1966) (Twilight Time, Blu-ray) – By even the most generous measure, The Killer Elite (1975) is one of Sam Peckinpah’s weakest film. Which, by Peckinpah standards, is still a cut above a great many films. He manages to get his own sensibility into the tale of black ops mercenaries in a culture of betrayal and retribution, with James Caan as the contract killer who returns from a crippling injury by sheer force of will and the desire for vengeance, and he stage some terrific set pieces to go with Caan’s brutal odyssey. It’s right in tune with the cinema of paranoia and conspiracy that bloomed in the seventies while also jumping on the martial arts craze with Caan taking on ninja warriors as well as his former partner (Robert Duvall). But it’s also a talky script and Peckinpah doesn’t really seem engaged in the stakes or the characters of this story, though Pack fans will appreciate appearances by Bo Hopkins and Gig Young. What makes this disc essential is its very special supplements: the American home video debut of Peckinpah’s 1966 made-for-television drama Noon Wine, an intimate 52-minute production shot on a combination of film and videotape and broadcast on TV once. Adapted by Peckinpah from the short novel by Katherine Ann Porter, this is an intimate production shot in a stripped down style that puts the focus on character and language. 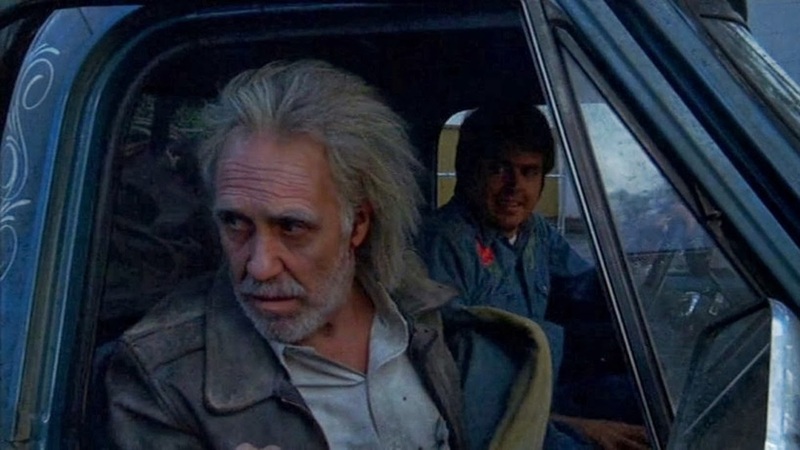 Jason Robards and Olivia de Havilland are the frontier couple who hire a Swedish drifter (Per Oscarsson) as a ranch hand and Theodore Bikel the traveler who tries to poison their minds with stories that the Swede is a dangerous madman. Robards plays one of Peckinpah’s most nuanced characters and de Havilland is a quiet force of moral backbone. Lovely and devastating. The master 2-inch tape was destroyed by ABC decades ago and until recently the only surviving copies were poor quality B&W kinescope recordings. This edition is mastered from 1-inch videotape copy of the master recording. It shows its age and provenance—lo-fidelity image, electric color, the occasional tape glitch—but looks remarkably good considering. Both programs feature commentary by film historians and Peckinpah experts Paul Seydor, Garner Simmons, and Nick Redman, which is very useful for both and frankly a labor of love when it comes to Noon Wine. What a treat. Also includes the featurettes “Passion and Poetry: Sam’s Killer Elite” and “Promoting The Killer Elite” and trailers and TV and radio spots. There may not be much interest for this disc outside of seventies action completists and devoted Peckinpah fans, but it is essential for anyone who loved Peckinpah’s movies. This double-feature shows two sides of Sam at their most extreme. At a basic level, Peckinpah’s is a cinema of oppositions. When one thinks of Westerns, a genre whose configurations and conventions Peckinpah has done a lot to redefine, one tends to reduce moral tensions to a simple antagonism between forces good and evil—something Peckinpah’s films emphatically don’t do. 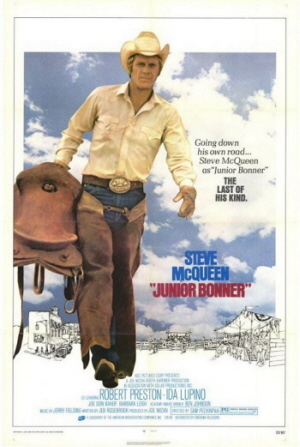 In Jr. Bonner, the kind of moral tension that operates between Buck Roan (Ben Johnson), a onetime cowboy who has become a notably successful businessman and smalltown icon, and Jr. (Steve McQueen), a middleaged cowboy who is having trouble winning, indexes the complexity of Peckinpah’s ideas about heroism and morality. There is a scene early in the film in which Jr.* goes into a saloon in his hometown of Prescott, Arizona, for a drink, and discovers Buck sitting in a corner booth. Jr. sits down and makes a pitch to Buck to fix things so that he’ll ride the bull Sunshine in the rodeo and hopefully win back some of his flagging self-esteem. (Sunshine is a bad bull who has thrown Jr. before; the cowboy is absolutely not seeking an easy ride.) Buck says, “I ain’t goin’ to make a living off somebody else’s pride,” and in the near-mythic uprightness of those few words lurks an inherent set of values that, on the one hand, stands opposed to the waywardness of Jr.’s pragmatic individualism, but that, on the other hand, suggests the same kind of dauntless adherence to archaic codes that lends the doomed Romanticism of Jr. Bonner an almost celebratory force. Buck and Jr. are two of a kind, cut from the same mythic block, even though they seem to be at odds about the means of maintaining their ways of life. Peckinpah’s characters do not readily yield to neat moral dichotomizing. Identity is the main positive force in Peckinpah’s films, but equally crucial is the moral attitude it embodies, or from which it derives. In The Ballad of Cable Hogue, we tend to forget that Hogue’s persevering out in the desert has as much to do with a somewhat nasty urge to avenge his having been cast out as it does with more enduringly admirable qualities like his love for Hildy and his societally utilitarian, and quite affable, capitalistic tendencies. Hogue (Jason Robards) is sustained in equal parts by forces which are destructive as well as those which are constructive, life-giving. Inherent in Peckinpah’s Westerns is the same dissociation of heroism from simplistic moral attitudes which figures as an essential premise in earlier Westerns by directors like Ford, Hawks, Mann, and Fuller. One has only to think of The Searchers, Red River, The Naked Spur, and Run of the Arrow to realize that the informing qualities of the modern Western protagonist include a sense of alienation, crippling flaws, blind spots, and weaknesses proportionate to the potentially tragic stature of the characters. In Peckinpah’s Westerns from Ride the High Country through Jr. Bonner, identity clings to lives and lifestyles that seem perennially on the road to extinction. But the plight of the Peckinpah “hero,” residing in a world where even the notion of heroism is ambiguous, is more complicated than the simple fact of his propensity to vanish from the historical scene. Peckinpah’s films ultimately seek to reconcile the necessity and the futility of a Romantic worldview, a dialectic which is important in evaluating Peckinpavian morality and, subsequently, in understanding Peckinpah’s characters within that context. 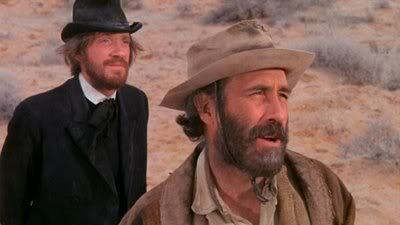 The two sides of that dialectic are often manifested in different characters within a given film: Jr. and Buck here, Billy the Kid and Pat Garrett, Ride the High Country‘s Steve Judd and Gil Westrum. All these pairs in some way suggest unities; they are seen not as separate entities inherently antagonistic, but as outgrowths of the same passing world who have been unnaturally wrenched into positions of fatal contravention. The Ballad of Cable Hogue is one of the most joyously earthy movies ever made. It’s also quite heavenly. That both qualities are valid in the film traces from their inextricability. And the inextricability has a lot to do with Cable Hogue‘s being a very funny movie. Plantinâ€™ and readinâ€™, plantinâ€™ and readinâ€™. Fill a man fulla lead, stick â€™im in the ground, then read words at him. Why when youâ€™ve killed a man do you then try to read the Lord in as a partner on the job? The Ballad of Cable Hogue is tough on the Lord. He gets all of the blame and none of the credit. Abandoned in a wasteland by his gold-prospecting partners, Cable calls on the Lord, albeit with untrusting upward glances. Job-like, he offers to repent for whatever the hell it was he didâ€”mistaking his ordeal for punishment for some unspecified wrong, rather than the trial of endurance, the rite of passage that it is. When he does indeed survive, it becomes his own doing, and none of the Lordâ€™s. Conversations with Godâ€”who does not answerâ€”bookend the film; and religion, or whatever passes for it, is never far away during the interim. The appearance of the Rev. Joshua Duncan Sloane establishes The Ballad of Cable Hogue as a movie about two men who talk to Godâ€”or who perhaps have their own way with life and write the Lord in as a partner on the deal. The title of Alan J Pakula’s latest film echoes the old stock melodrama line “Along comes Jones” and that’s no accident. Here we have a tough-but-tender cowgirl working her dead father’s ranch with only a lovable grizzled old coot for a ranchhand; a somber villain moving through his dark house like Dracula in his castle, hatching designs on the heroine’s land as well as her body; a land-grabbing industrialist conspiring with the local banker to turn rangeland into oil wells; a tall, quiet wrangler winning the girl’s heart and saving her land to boot; singing cowboys, fireside heart-to-hearts, a crisis with hero and heroine trapped by villain in a burning building, a climactic shootout, and boy-gets-girl. From the tentative cynicism of The Parallax View and All the President’s Men, Pakula hasreturned with a vengeance to the romantic melodrama of his earlier films, all characterized by essentially corny ideas handled in an utterly uncorny manner. Kluteand Comes a Horsemanare but two special cases of the same basic plot overlay: tough professional man saves woman from villainy and from herself, winning her heart in the process. And The Sterile Cuckoo, Love and Pain and the Whole Damn Thing, Klute, andComes a Horsemanmay all be seen as variations on the theme of simple, direct man dealing with complex, independent woman.